The damper is the metal door located just above the firebox. Its purpose is to prevent cold air from entering your home when you AREN'T having a fire. When you ARE having a fire, you want to ensure that your damper opens FULLY. This is one of the points that we check as part of our inspection. Dampers that do not fully open often cause smoke to come back into your house when you make a fire. In fact, along with needing a cleaning, faulty dampers are one of the major causes of smoking back. Sometimes, particularly when there is no chimney cap on top to keep out the rain, your damper can become so rusted that it no longer operates. The handle of your damper can even rust off! Also, some older houses were built without dampers in the fireplace. In these cases, we can install a “top damper”. This is a spring-loaded plate that fits inside a standard chimney cap on top of your chimney. A fire-proof cable hangs down from this damper plate, through the chimney and into your firebox below. We attach a small bracket to the side wall of your firebox, and you open and close the damper by pulling and latching this cable. 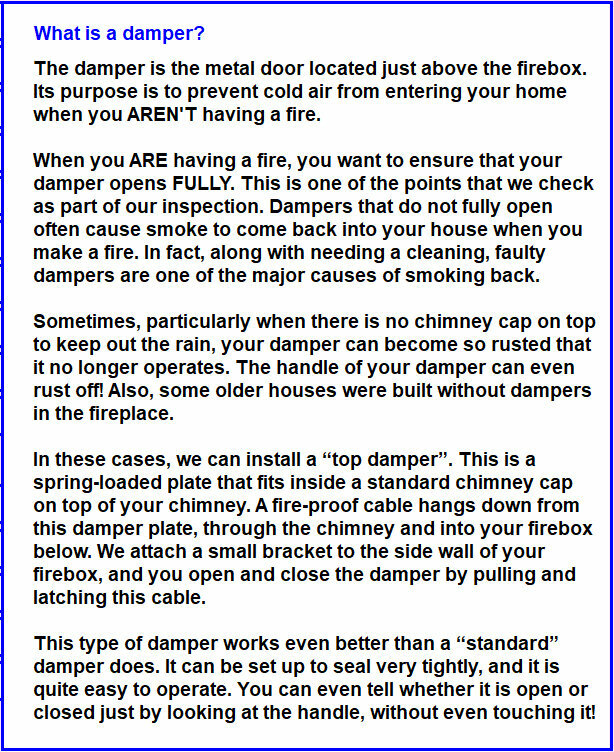 This type of damper works even better than a “standard” damper does. It can be set up to seal very tightly, and it is quite easy to operate. You can even tell whether it is open or closed just by looking at the handle, without even touching it!